Breathing during running can be one of the hardest things to figure out as you start running. You feel like you’re constantly working to pull in as much air as you can while the muscles in your legs are burning. If you’ve felt this way, you’re not alone. When acquaintances find out I’m a running coach, generally the first question I get asked is how to not hate running, and often the second is how to properly breathe while running. 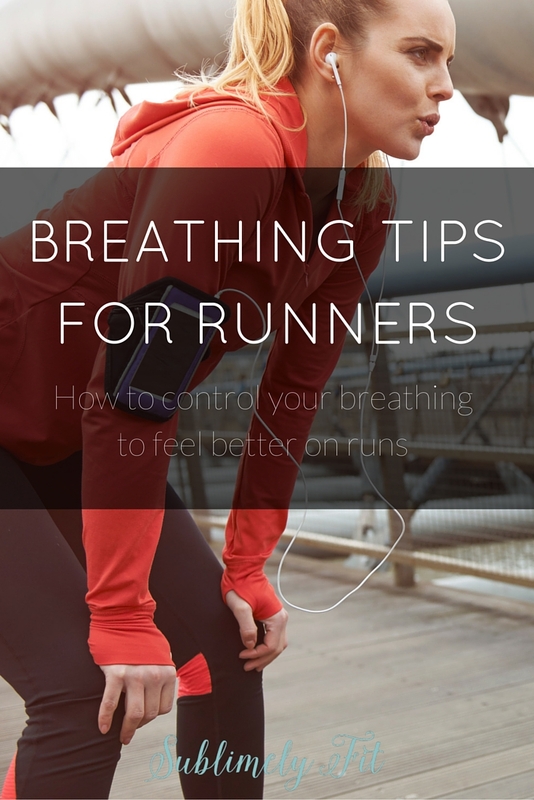 And because I know a lot of you are starting on your running journey in preparation for spring races, I wanted to share my best tips for controlling your breath as you run. Sometimes we have trouble breathing when we’re running because we’re running too fast. Unless you’re running sprints, you shouldn’t feel like you’re breathing as hard as you possibly can. During long runs and easy runs, your breath should feel under control. In fact, you should be able to speak in complete sentences. So, if you’re having trouble breathing, you most likely need to run more slowly because you’re going too fast. Unless you’re specifically doing speed work, which for most of us should only happen once or twice a week, max, your breathing should be under control. Run too fast and you’ll drastically increase your risk of getting injured, and running fast all the time will not make you a faster runner. So, control your pace, and focus on making your breaths a little longer, taking in air through your nose and your mouth. If you’re running a recovery run, which is meant to be run at a very slow pace, try to breathe just through your nose if you can, which helps you keep at a slow enough pace. Breath control is a huge reason why I’m a big fan of yoga for runners; we learn pranayama, or breath control, as part of our yoga practice, and pranayama is hugely helpful for runners. Sometimes when you’re running, you completely forget about your breath and focus on other things, what pace your GPS watch says you’re holding, your to-do list, or what food you’re going to devour when you get home, if you’re like me. The lack of focus on your breath can lead to shallow, inefficient breathing because you’re not thinking about it. Think about taking long, deep breaths, pulling your air down into your belly, particularly when your breathing starts to feel shallow. Some say that it’s best to inhale for two footfalls, then exhale for two footfalls, but it’s most important to breathe in a way that feels comfortable to you. Play around with different breathing rhythms until you find something that feels most natural. Actively thinking about your breath, no matter what pattern you use, will help you focus on breathing and taking in as much air as you can, which is what you should be working toward. And, focusing on your breath will allow you to focus on the parts of your run that you can control, helping you to push aside negative thoughts that may pop into your head as you run. Thinking about breathing helps you to find a moving meditation. Most of us aren’t used to taking truly deep breaths because our everyday lives don’t require it. However, when you run, it’s important to get as much air into your lungs as you can so that you can bring in more oxygen to fuel your muscles. That oxygen is used in aerobic cellular respiration, which is much more efficient than anaerobic (without oxygen) cellular respiration, both of which provide energy to cells to do work, if you remember back to high school biology. Test out belly breathing while you’re not moving first. Find a comfortable seat, then sit nice and tall. Place one hand on your chest and one on your belly. As you inhale, feel your belly move out, as your diaphragm (the muscle that helps you breathe) moves down, then expand the sides of your ribcage, ending with expanding your chest. Exhale in reverse. Practice breathing like this for a few minutes a few days a week. It’s not only calming, but it will help you get used to taking deep breaths, so it’s easier to use muscle memory to breathe deeply during your runs. How do you control your breathing as you run? This has been a big one for me as an asthmatic. When I’m feeling winded, I try to focus on counting my breath and slowing it down– focusing on getting the air deep from the lungs and belly and extending the release! Great tips. Pinned! Yes, exactly, Julie. Focusing on controlling the breath is so helpful. Thanks for pinning! I really notice when I don’t breath properly because I get major cramps. This usually happens when I try to sing and run, it’s a bad idea! The biggest thing is THINKING about it. You are so right. Great tips, Beth. When coaching people on treadmills during group exercise classes, I always tell people to breathe in through their nose and out through their mouth for the best flow when running. Breathing is SO important, and I bet your yoga background helps you with that a lot. Yes, it’s amazing how much breathing technique you pick up in yoga translates over to running. Thanks for sharing your expertise, Ashley! Beth I am a 12 year old and training for a 5k I’m a little bigger and want to know how to focus on sleep, training, and eating right for it. This one took me a long time because I would always start out going too fast. Once I learned to pace myself it became much easier to control my breathing. I’m sure if I went out now though it would be a whole mess haha. We must be on the same wavelength, because that’s my post for tomorrow! I also do in for 3 strides, out for 3 strides when I feel myself getting tense and not breathing properly. Being aware of my breathing helps me a lot on runs! I now use breathing as one of the factors in gauging my perceived effort, since it helps me then develop a pattern of breathes. Great tips! Me too, Laura! I trained for a while with a HRM, and after learning how hard I should be breathing in each zone, I was able to do a lot better at training in the right zone. It’s so helpful! Actually, i rarely pay attention to breathing when running. Your article is good for me. Thanks!